After several failed shrimp dishes (mostly due to the poor quality of shrimp) finally something great! Large gulf shrimps (20-30 per lb) in their shells marinated with mexican flavors – fresh bay leave/oregano/hot green chile powder/lime zest, and olive oil. Cooked on a very hot skillet for about 5mins total turning once. Nice side fashioned from Bayless potato tacos: poblano rajas con cream with chard leaves wilted in and shuttered cooked fingerlings added at the end. Totally good on its own. Nice recipe for meatballs in tomatillo (with some chipotle) sauce. Couple problems – the color of cooked sauce – on the pic it was pretty and clear. In reality it came out grayish, apparently from the juice leaking from meat. Possible remedy? Cook meatballs in stock and add the sauce at the end. Or even bake them? Zucchini/corn/mushrooms side was ont he otehr hand excellent (Kennedy’s blue book). The only thing i’ll change for the next time is to start with mushrooms – i used tiny oysters when hers was an huilacoche dish. 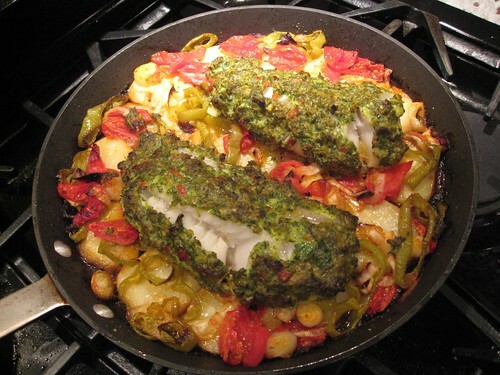 Nice vegetarian dinner – quick but full of flavor. Steamed and peeled fingerlings, small whole shiitake mushrooms caps and scallion whites tossed with melted butter, white miso and mirin (Eden brand that doesn’t have any sugar in it). Roasted for 10 mins in 425F convection. Sprinkled with scallion greens and cilantro before serving. Very nice, and of course goes well with some good hoppy IPA. 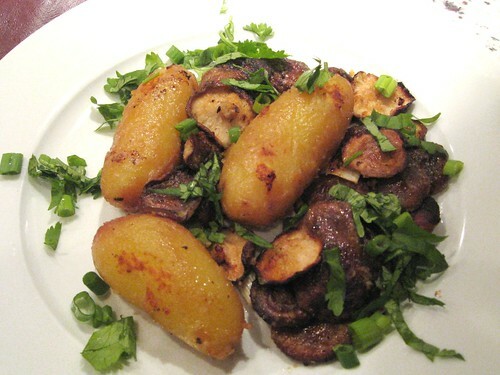 I love smart dishes with eggplant – it’s not that easy to cook it right. Tonight i concocted some sort of ratatouille: wish i had tomatillos for even more regional flavors but tomatoes were good enough. Charred and skinned poblanos, halved and broiled globe eggplant. 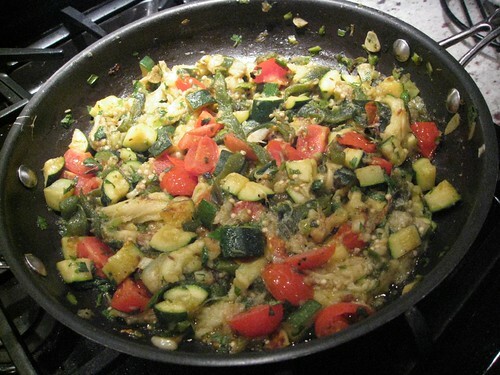 Cumin, scallions, zucchini, garlic, cherry toms, cilantro and mint. For the next time i’ll use tomatillos, and double eggplants. My first try was of 3 chiles, 2 small zucchini, 1lb eggplant, 8 cherry tomatoes, bunch of fat scallions. 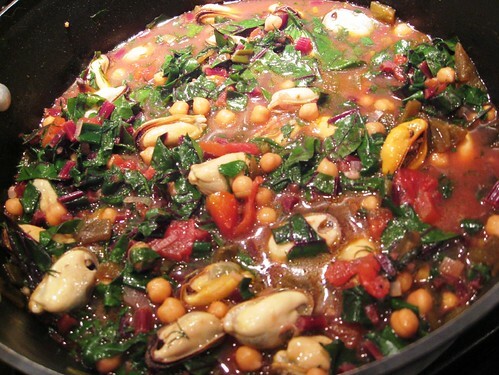 This soup from Marcella Hazan sounded very nice and simple – a lot of olive oil, garlic, parsley and white wine. I love squid from Wegmans, and they had good baby artichokes. Marcella suggested to cut tubes into thin rings – 1/4″ which sounded not a typical 1/2″ treatment but i trusted her and was curious. 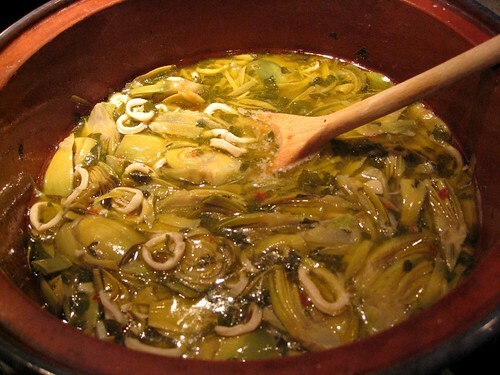 The recipe calls for cooking squid for about 40mins before adding sliced artichokes. And somewhere here the problem lurked. When i tasted squid (several times during the cooking) it stayed flavorless and rubbery. I can blame this on two things – either the thin cut and the squid itself: though Wegmans sells two types of squid – freshly caught and frozen, i suspect this time they sold the latter under the label of the former – in theory this never should happen but i really don’t have other explanation – will continue to experiment because the soup is worth it.